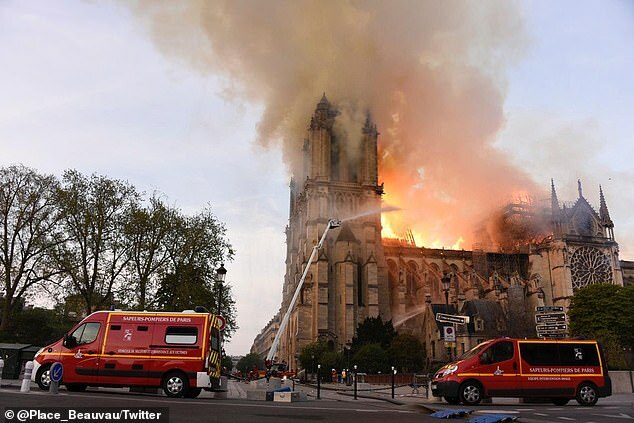 The French Interior Ministry said 400 firefighters were mobilised to help tackle the blaze that engulfed the Notre Dame Cathedral on Monday. 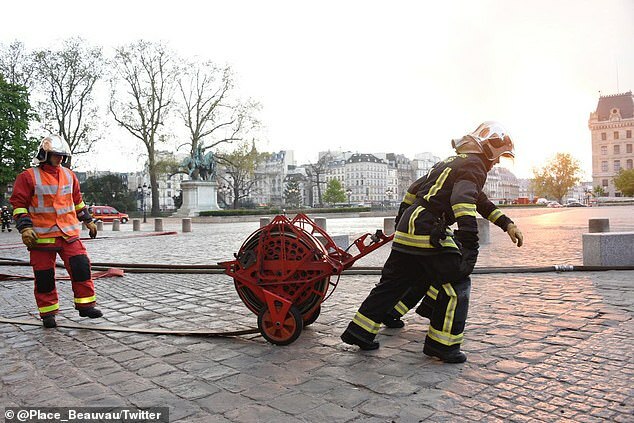 And while hundreds of comments flooded the Pompiers du Paris Twitter page in support of the brave firefighters, many questions were raised as to how the fire was dealt with. Why did the fire brigade not drop water on the Notre Dame Cathedral? 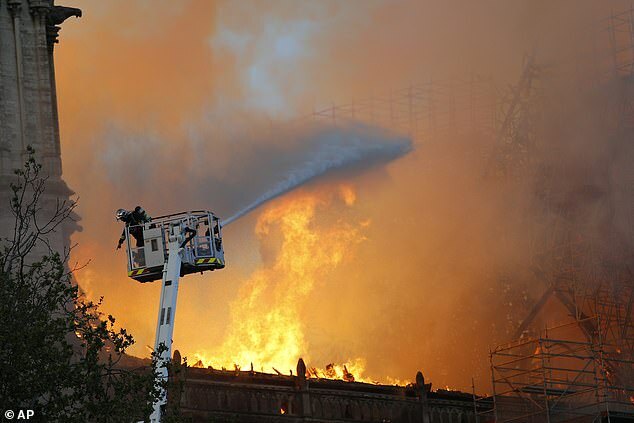 Authorities have revealed they were unable to drop water on the landmark to tame the blaze for fear it would ruin what was left of the 850-year-old cathedral as well as injuring people nearby. In cases of intense fires, a water bomber jet – called a Canadair – can be deployed to drop large amounts of water. French news site Le Monde, explained: ‘A Canadair projects about six tonnes of water at high speed to the ground. ‘The danger is significant of hurting one or more people around the building – which is why Canadair interventions are so infrequent in urban and peri-urban areas. Did fire crews react quickly enough? 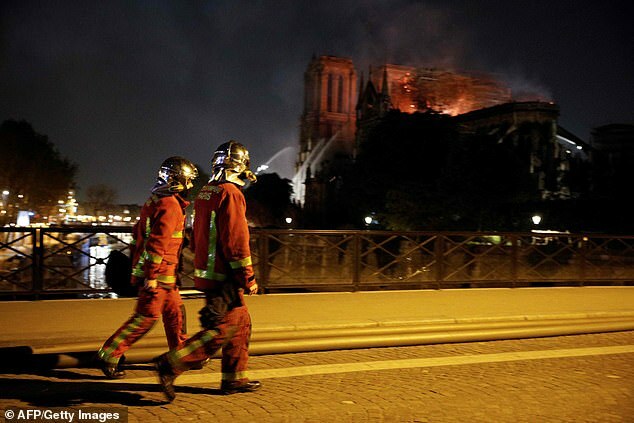 The Paris fire chief last night paid tribute to his crews, saying they had saved the cathedral from total destruction. 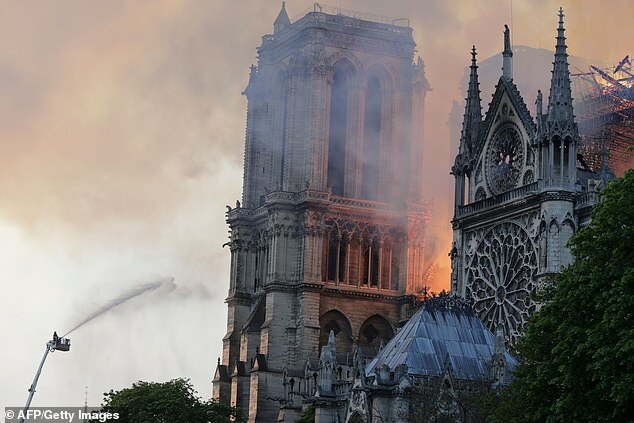 Commander Jean-Claude Gallet said a major accomplishment of hundreds of firefighters was stopping the flames from spreading to the north tower belfry. 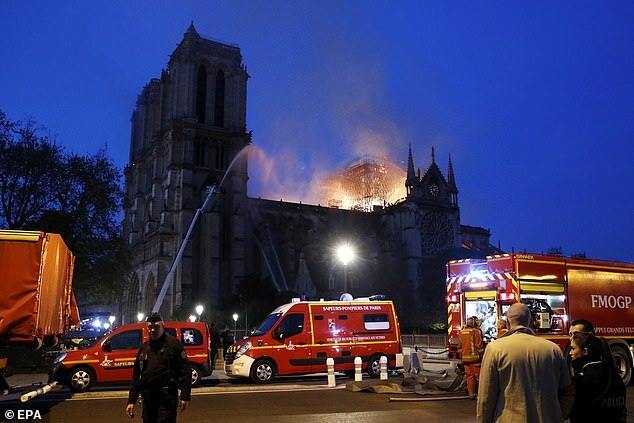 He said two-thirds of Notre Dame’s roofing ‘has been ravaged’ and one firefighter was injured. Fire crews will keep working overnight to cool down the structure, Mr Gallet added. However, there was criticism that the fire service had not responded quickly enough – and didn’t seem to have the right equipment to tackle such a large blaze. Flames appeared to be raging inside the cathedral for a long time before water jets capable of stopping them were mobilised. Many observers, watching the tragedy unfold on TV, asked whether the fire teams had been well-equipped enough to deal with flames at such a height. Last night, the French interior ministry tried to defend the response – insisting that 400 firemen had been deployed. The ministry suggested that aircraft were not used because it was feared that the weight of water falling at such a height could cause large parts of the cathedral to collapse. In an online statement it said that an ‘exceptional device’ had been deployed to tackle the fire, with a crane lifting a fireman to tackle the blaze. 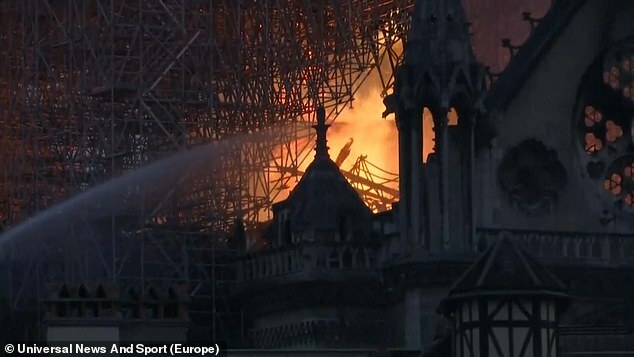 However, pictures appeared to show that this was the only one of its kind and residents questioned why more pressure hoses and cherry-picker cranes were not on site to be able to douse the flames from above as they took hold of the scaffolding and the roof near to the spire. As the blaze raged, the Paris authorities insisted that getting fire teams to the top of the building ‘was almost impossible’. Local resident Michel Dupont said those living around the cathedral were upset more equipment was not on site to spray water at the flames high up. 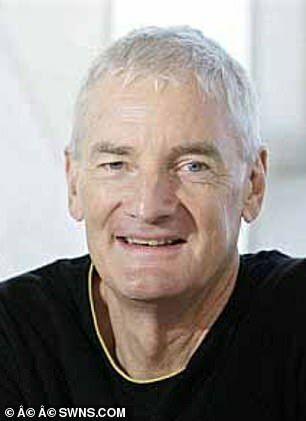 ‘A lot of us are asking questions about the authorities’ response,’ he said. Liz Boeder, another Parisian, said ‘we need California firefighters’, in reference to the water-carrying aircraft used to tackle the forest fires in the US last year. Others who watched the blaze unfold on live TV also raised questions. 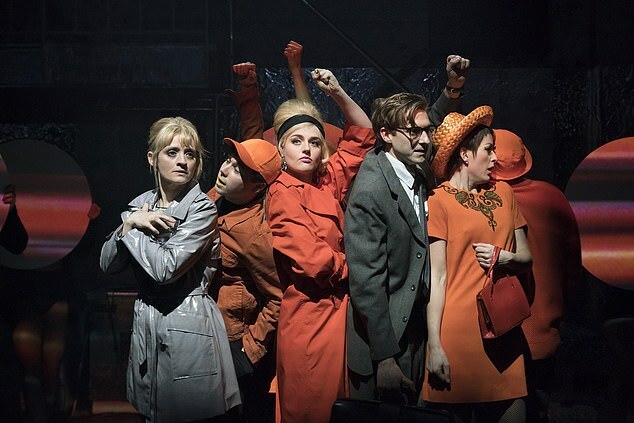 What caused the blaze to spread so quickly? Using innovative architectural techniques to assert France’s growing status as a European power, its soaring vaulted ceilings, flying buttresses and doors surmounted by a row of figures of Old Testament kings were an expression of royal grandeur. The building is longer than a football pitch at 427ft, with its largely wooden spire – which collapsed on Monday – once soaring 300ft into the Parisian sky. 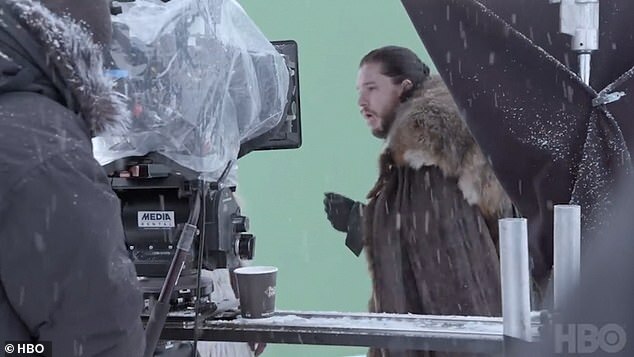 Indeed it is the mode of constructing of the roof structure – entirely in timber, with each beam being made from a single oak tree in a tight lattice – which may be the key to understanding last night’s disaster. In all, 5,000 oaks were used in making it. 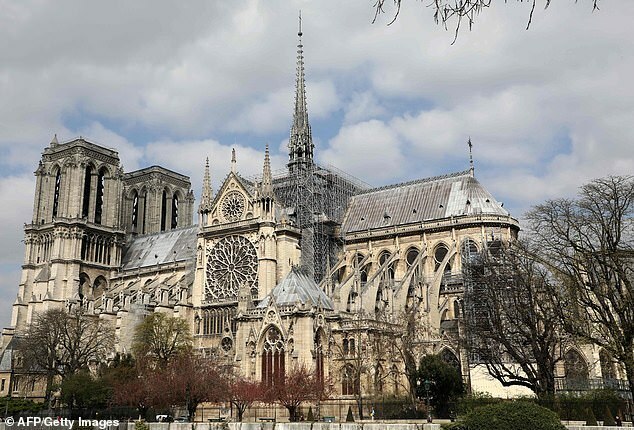 ‘It makes sense that it would be incredibly flammable,’ explained Notre Dame contributor Daniel Christian on the website for the landmark. The structure’s aging wooden frame has long been a topic of concern, and a $6.8million renovation project was underway to address some of the many issues at the historic building. But as the fire ‘started near the spire, where the scaffolding is,’ it has been suggested that the renovation work sparked the flames. Officials have not yet determined if this was the case.